If you have a Starbucks fan in your life, a gift card is probably a good choice of gift if you are unsure of what to get them. With a gift card, they can always stock up on their favorite whole beans or simply enjoy a few drinks over the course of a month. An even better gift, however, might be the 2013 Coffee Refill Tumbler. This tumbler entitles the user to one free grande drip coffee every day in January. The tumbler costs $30 and a grande drip (in my neighborhood, anyway) runs $1.95, so you’re basically getting 50% of those coffees for free. 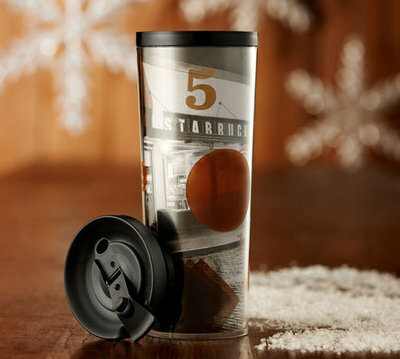 Starbucks offered a similar tumbler that granted free grande espresso drinks in January on Black Friday (for $75/$65 pm sale, though they have long since sold out). I’m assuming that, if you’re a Gold card holder, you’ll probably be able to get free refills on that coffee, as well. The cup itself is made with 35% post consumer recycled materials, so it is eco-friendly in general in addition to being less wasteful than the usual paper cups. And you, or your giftee, will still get $.10 off per drink after January is up.